In 1988, James (3-6 metres) Hansen forecast that Manhattan’s West Side Highway would be submerged by 2008. 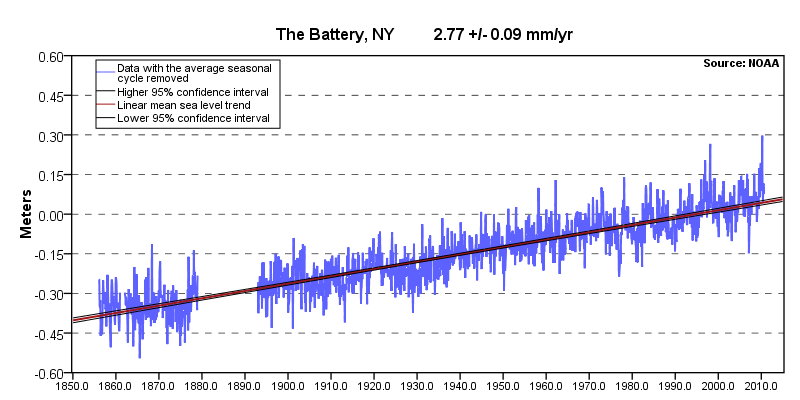 Since Hansen’s forecast was made, sea level in New York has risen less than 2 inches. The rate of sea level rise shows no correlation with atmospheric CO2. One bird that hasn’t yet left the area is Chicken Little. Hopefully he will fly the coop soon though. James Hansen is a combination of a wanna-be dragon slayer & delusional prophet, while maintaining a massive NASA salary plus benefits. Yes, in James’s world he can have his cake and eat it and everyone else’s as well. What a wonderful world! So crime is now a proxy for rising temperatures? Stop crime, tear down the cities to reduce UHI! Jeanne Dixon had a better track record than Hansen as a forecaster and she was a psychic. Of course the West Side highway has been rebuilt since he made that comment. It is no higher now than it was then. The old one used to get flooded in heavy rain and the present one was flooded as recently as Friday. Must be raining really hard to raise sea level like that. The West Side Highway [which runs along the Hudson River] will be under water. the Westside highway is at the same level as every other street in New York. And it has never flooded. ———Which ones, the pidgeons ? There are plenty of birds. Crime in New york city has dropped down to early ’60’s levels. But there are a lot of police. Nice. Are we talking about rain ( my basement flooded too ) or Sea Level ? The river and harbor do not rise and flood the roadway or anything else. You shouldn’t expect it to be, it should be correllated with the radiative forcing due to CO2, which is a logarithmic relationship. As Co2 has been rising approximately exponentially, the radiative forcing has been increasing approximately linearly, and so have sea levels, so they are correlated. Huh? Logarithmic is less than linear. You are shooting your argument in the foot. Hint: what is log(exp(t)) ? The radiative forcing due to CO2 is a logarithmic function of the atmospoheric concentration of CO2. CO2 concentrations are observed to be increasing roughly exponentially. Thus the radiative forcing is increasing roughly linearly. Any thermal expansion of the oceans depends on the radiative forcing, not the atmospheric concentration, so linear increase in sea levels is about what you should expect for exponentially increasing CO2 levels. CO2 effects are logarithmic. That means subsequent increases have less and less effect. 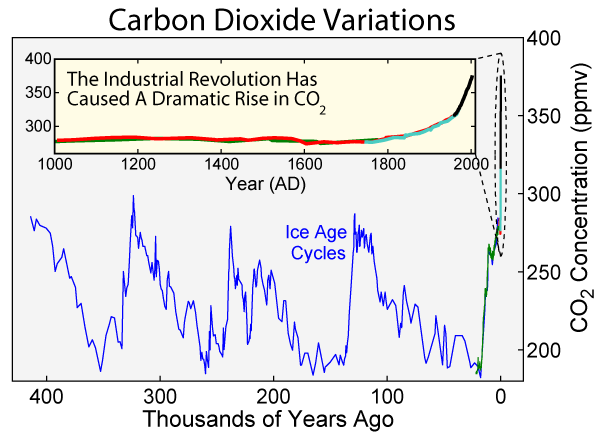 CO2 has NOT been rising exponentially. CO2’s rise is linear. Radiative forcing from CO2 has NOT been increasing approximately linearly, since CO2’s effects are logarithmic. The rate of sea level rise DOES show a correlation with atmospheric CO2. Both are rising linearly. But just because two things are rising linearly doesn’t mean they are related strongly. Even the Mauna loa dataset is obviously not linear and has a steeper curve at the end than it does at the start, although the rate constant of the exponential is small, so the curvature is only slight. I agree that two things rising linearly doesn’t mean they are strongly related, but then again the idea that CO2 is a GHG is not based on that corellation, but on physics, and has been well understood since the 1950s. It is Steve that keeps pointing out correllations, and “corellation does not imply causation” applies just as well to his correllations as anyone elses. You started by claiming it is not linear, and now you are arguing that it is. No Steve, I have explained it perfectly clearly, if you think there is an inconsistency, there is a second possibility, which is that you failed to understand the issue. Now if you have questions I am perfectly happy to try to answer them. If you keep talking, maybe Manhattan will drown retroactively back to 2008. O.K., so you are not interested in a serious discussion on this topic either, and again resort to childish one-liners. Your choice. I’m not interested in endless diversions. Dikran, it is well known that between 1/3 and 1/2 of all berylium, oxygen, and carbon molecules in air pockets in the ice are lost when those pockets explode under drilling pressure. I once asked the University of Washington professor David Batisti how they account for this loss and he said “we don’t.” It is idiotic to concatenate ice core data onto the last 55 years of CO2 data from Hawaii and ignore the CO2 data from 1820 -1950 from the chemical method which is accurate within 10 parts per million compared to the current IR method. That method, although limited to Europe, did show CO2 levels as high as 420 ppmv even in rural areas.